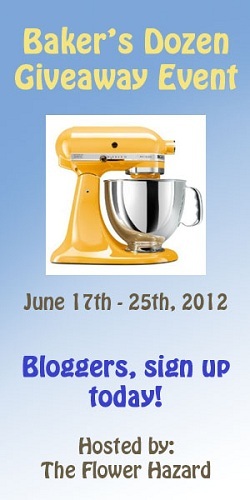 ATTENTION BLOGGERS: Baker’s Dozen Giveaway Event Sign Ups! Are you a blogger looking to gain more followers? This is a blog hop giveaway, hosted by The Flower Hazard, which is a great way for you to gain followers and exposure for your blog. The main prize will be a KitchenAid Artisan 5-Quart Stand Mixer! It is a perfect time to find your inner baker! With new technology comes greater baked goods, but some items have stood the test of time, like KitchenAid Mixers! The Flower Hazard is proud to present the Baker’s Dozen Giveaway Event from June 17 12:01 PM EST to June 25 at midnight EST and is accepting signups now! « Are You a Smartphone User? If so, Get Rewarded!